The name of Passchendaele conjures a frightening image of the Great War. The Third Battle of Ypres, as it was formally named, covered a time span from 31 July to 12 November 1917. The weather and terrain coupled with the losses it generated has left it with a legacy of utter horror and total disbelief that men on both sides could fight on under such horrendous conditions. The preliminary bombardment rained 4.3 million shells on the German positions from 17 to 30 July 1917. On average, thereafter the guns fired two million shells a week for the balance of the campaign. The drainage system in the delicate Flanders plain was destroyed and the high water table brought to the surface. The autumn rains came early and stayed. The beeks no longer had banks to contain them and the small valleys became impassable swamps. Any route or firm ground became obvious points of attack and the Germans took appropriate defensive measures to cover them. The attacking forces bogged down in an ever increasing quagmire. The first phase of the Canadian assault was launched on the morning 26th October 1917 under a wet mist that eventually gave way to rain, followed by a second assault on 30 October. In the prior operation against the German defensive Flanders Line I, the Australians who had been very successful, albeit with great loss, were ground down into the mud by uncut wire, the mutually supporting machine gun emplacements and pillboxes. The commander of the 3rd Canadian Division, General Louis Lipsett called it about the strongest position he had ever seen - and he had been fighting in all the Canadian operations since March 1915. The stage was set for the Princess Patricia's Canadian Light Infantry to enter one of the most horrific and exhausting battles of the Great War. The PPCLI Commanding Officer, Lieutenant-Colonel Agar Adamson, DSO recorded in a letter "The condition of the ground beggars description. Just one mass of shell-holes, all full of water. The strongest and youngest men cannot navigate without falling down. The people we relieve tell me in the attack, a great many of their men drowned in shell holes for want of strength to pull themselves out when dog-tired." Waiting for the barrage to begin, Major Papineau, OC No. 3 Company, looked up the slope of Meetcheele Ridge at the pillboxes and German defences. Beside him stood Major Hugh Niven who had come to wish him and his men well. "You know, Hughie, this is suicide." At 5.50 a.m. the supporting barrage crashed down on the area of the crossroad and three minutes later the assaulting companies moved forward in three waves. By this time Major Papineau was already dead, blown in half by a direct hit. The first wave was in line formation which was soon broken up by the difficult ground and enemy artillery and machine gun fire. The second wave moved forward in artillery formation, small groups of men spread out, as did the third wave, who were responsible for mopping up the captured positions. With them came the Brigade machine gun detachments. And behind them came the support companies in artillery formation. Six hundred men struggling forward through the mud and waterfilled shell holes. The barrage timetable tried to allow for the slow, brutal going of the land. The guns lifted fifty yards every four minutes, or a total of 750 yards an hour! The men wallowed forward in the mud and slime. The German counter barrage caught them within three minutes of jumping-off. On the left, both company commanders were killed, one as he left his "trench." By the end of the first hour almost every subaltern with the rifle companies was dead, wounded or missing. The casualties among the N.C.O.s was nearly as severe. The battle developed in two separate zones as the Patricia's pushed forward. On the right, in the low ground by Snipe Hall and running beside the Ravebeek, No. 2 Company with No. 4 in support quickly passed through the German artillery barrage. Their main danger came from rifle and light machine guns firing from the Meetcheele Ridge high ground. Most of the losses came from the German snipers. Slowly, but surely they clawed their way forward toward the intermediate objective of Duck Lodge. Taking losses from the hillside, they bombed the enemy out of their positions in the low ground. By 7.00 a.m. they had reached Duck Lodge. A sharp, short fight settled ownership of Duck Lodge in favour of the Patricia's - but both companies lost heavily. The artillery barrage gave them a twenty minute curtain of fire on the high ground which they used to reorganize and dig in. Across the Ravebeek on the high ground to the Patricia's right, the 72nd Bn swept forward from their assault line and quickly secured Crest Farm. The loss of this strategic position and Duck Lodge made the Patricia attack on the right less costly as they carried on toward the final objective of Graf Farm. However, enemy strong points and machine guns on the ridges stopped them short of the road and their final objective. The attack in the second zone on the left was straight up the Bellevue Spur to Meetcheele Ridge in the face of murderous fire. The taking of machine guns housed in pillboxes and surrounded by dug-in troops was a bloody-minded battle won on sheer guts and determination. The fight became a series of small section and platoon battles swirling around the German strong points and pillboxes. The action earned the Regiment its first Victoria Crosses of the Great War. What was left of the Regiment dug-in and held onto what they had gained at such a cost. Out of the twenty-five officers who entered the battle, twenty were casualties including nine killed or missing. There were 150 other ranks killed or missing, along with a further 193 wounded. In all, a sixty percent casualty rate inflicted on the Regiment during its valiant assault. Today, there are 503 Patricia soldiers commemorated on the Memorial to the Missing at the Menin Gate. Of these, 133 are Passchendaele casualties with no known grave. On the crest of the hill about a thousand meters from the village of the same name is the Passchendaele New British Cemetery. The cemetery holds 2,091 graves gathered after the war from the battlefields in the area and over 75 per cent are unnamed (1,601). Of the 452 Unknown Canadians who have been identified by nationality, eight have been registered as Patricias. A group of Patricias was recorded by the Regiment as having been buried together on the battlefield of Meetcheele Ridge at 28 D5 d15.70 and in due time were recovered by Imperial War Graves Commission who listed the map reference as 28 D 5 d2.9. Several of the bodies, including a Lieutenant Almon were identified and accorded a named grave, another three were not so fortunate. During research for the book "With The Patricia's In Flanders 1914-1918: Then & Now", it became possible to cross reference Regimental records with those of the Commonwealth War Grave Commission. As a result several Patricia's have been accorded known graves after more than eighty years, and several more are being investigated. In May 2001, a case was presented to the Commonwealth War Graves Commission reference the grave of an Unknown Lieutenant and two other men in Passchendaele New British Cemetery. The evidence was accepted as to the identity of the Lieutenant, while the other two could not be placed in a specific grave of the three possibles and therefore remain "missing" but definitely buried in the cemetery. Who was the "Unknown Lieutenant"? Harold Edward Agar was born in Howden, East Yorkshire, England 28 September 1891. 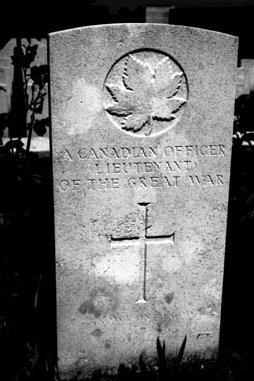 He served five years 5th East Yorks (Territorials) prior to emigrating to Canada. He was employed as a school teacher when the war broke out in August 1914 and he promptly joined in Edmonton a new Regiment that forming. As an "Original" member of the Princess Patricia's Canadian Light Infantry (PPCLI), he was assigned the rank of private and the regimental number of 748. Agar arrived in England with the 1st Canadian Contingent on 14 October 1914. He crossed to France with the Regiment as part of the British 27th Division on 20 December 1914. Suffering from frostbitten feet in the waterlogged trenches of St Eloi on 15 January , he was sent to St Omer and returned to his unit nine days later. During the counter attack against the infamous "Mound" at St Eloi, Agar was hospitalized with arm injury (16 March 1915) and returned to the unit in Polygon Wood 18 April 1915 just before the first gas attack in the Ypres Salient. He took part in the silent withdrawal from Polygon Wood to the new, but poorly prepared line on the Frezenberg and Bellewaerde Ridges. Under direct enemy observation and fire near Hooge, Agar was struck in head and right arm while digging the new position on Bellewaerde Ridge 4 May 1915. In many ways he was lucky. The Regiment occupied the same trenches again on the night 7/8 May with just over six hundred men. Less than twenty-four later they walked off the position with only one hundred and fifty. Agar recovered and returned to the PPCLI 7 July 1915 in the Armentieres Sector. The PPCLI left the British 27th Division who were on their way to Salonika, and joined the Canadian Corps as part of the 7th Brigade in December 1915. Agar was promoted to Lance/Corporal (unpaid) 3 January 1916. He was wounded in the shoulder during the heavy fighting at Sanctuary Wood (Battle of Mount Sorrel) near Ypres 2 June 1916. Returning to his shattered Regiment on 29 June 1916, he was promoted to Corporal five days later. 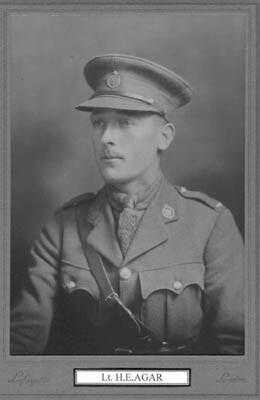 He was quickly promoted again three days later to Sergeant and served during the Somme attacks at Courcelette and Regina Trench in September 1916. Agar left the Vimy Ridge Sector just before the famous assault on the ridge in April 1917. He was posted to Seaford and OTC Bexhill 21 March 1917 to become an officer. Agar was commissioned as a Lieutenant in the 7th Reserve Battalion on 1 July 1917. He crossed to France an rejoined the PPCLI in the field in the Arras Sector on 10 October 1917. A short time later, the Canadian Corps moved north to the Ypres Salient to take part in the Passchendaele offensive On the morning of 30 October 1917, the Patricia's assaulted Meetcheele Ridge. Moving forward in support on the left as part of No. 1 Company, Lieutenant Agar survived the assault and reached the objective. About an hour after doing so he was wounded in the head. With the line consolidated and being reinforced, Agar started back to the aid station, running from shell hole to shell hole across the exposed terrain. He was stopped by Captain MacPherson who bound up his wound and stayed there for half an hour before deciding to take his chances in going back. Fifty yards later he was sniped in the head and killed. He was age 26. Agar was buried with the body of Lieutenant Almon and several other Patricias, but his body was not identified after the war. However, it was the link of Almon and Agar that allowed him to be identified eighty-four years later. The other two men to whom fate has not been so kind in identifying eighty-four years later were Private Walter Lawson Ruddy (489803) of Toronto, Ontario and Lance-Corporal John Robert Newell (670083) of Wicklow, Ireland. One of Agar's brothers, Private Cyril Cuthbert Agar, 2nd Bn West Yorkshire Regiment died, age 19, as a prisoner of war 1 Aug 1918. He is now buried in Valciennes Communal Cemetery. They are both commemorated on the Howden War memorial, East Yorkshire. Footnote: With the tragic events of 11 September 2001 in Washington and New York it has proven impossible to mount a suitable remembrance by the Regiment at this time in Passchendale New British Cemetery. The original headstone has been received by the Regiment in the Home Garrison of Edmonton, Alberta and plans are proceeding to make it a focal point of Remembrance for all the missing soldiers of the PPCLI from the Great War. They number over six hundred men. It will most likely take an honoured spot in the newly constructed Andrew Hamilton Gault Memorial Park, named after the Founder of the Regiment. Lieutenant Harold Edward Agar will be more vividly remembered during the 11th of November celebrations as we pause to reflect on the cost of Battle Honours of a proud Regiment. Should you have pictures or information on any Patricia, particularly those killed in the Great War, please contact the author of this article, Capt. Steve Newman. Copyright © Capt. Steve Newman, PPCLI, July, 1998.